Interested in becoming an integral member of our volunteer team? We bring four new puppies into our training program every year and our program is built on a strong base of volunteer foster families. 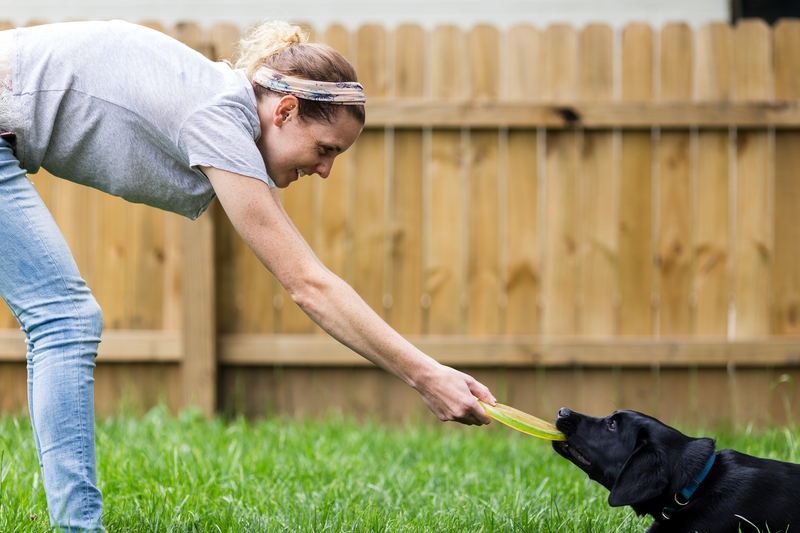 These families and individuals open their homes and hearts for two years while our puppies in training work toward placement with their future recipient. Is it sad giving your puppy up at the end of two years? Of course. However, is it incredibly fulfilling and worth it? Yes! All of our fosters tell us they feel an amazing sense of pride when they see the puppy they love so much and have put so much time into go out into the world to do the job they were meant to do. Watching the connection form between your adult dog and a child who needs them is both overwhelming and rewarding. The feeling of pride you’ll get seeing a life forever changed thanks to your time, effort, and love, is unlike any other experience. If you think you and your family are good candidates for this program, we would love to talk further and meet you in your home. Please contact us telling us why you think you would be a fit for one of our puppies. Family lives or works near Narberth, PA so they can drop off/pick up the dog Monday – Friday. 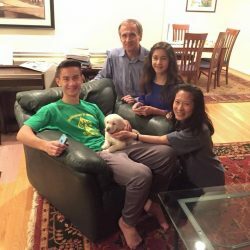 Family commits to attending 4-6 hours of training class prior to the arrival of their puppy and continuing classes every week and then every other week as the training period progresses. Family commits to fostering for up to 2 years. How long does the foster puppy live with us? The puppy in training lives with you for 18-24 months. During this time the puppy lives with you at night and on weekends. Where can we take our foster puppy? Once s/he is potty trained and ready, and you’ve passed our certification showing you’re ready as well, s/he can begin accompanying you in public. As the puppy grows older and moves through adolescence into adulthood, the places you can take your dog increase. 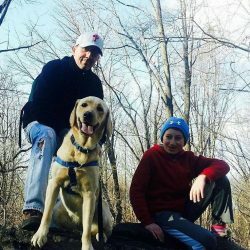 The puppy wears a vest that says, “service dog in training,” and in Pennsylvania the law allows these dogs access to the same public spaces a full working service dog is allowed when with a certified handler. This dog will spend his/her life with an active person and must be comfortable in any and all situations. The more different experiences s/he has, the more successful and well adjusted s/he is when matched with his/her child. Is it okay if we have other dogs in the house? Yes, but we will want to meet your dog and make sure adding a puppy to the mix won’t cause either of them too much stress. Is it okay if we have small children in the house? Absolutely. This is a realistic situation for the future lives of our dogs. We realize it may mean a bit of chaos, but that is good for our dogs to experience. What does the puppy do during the day? The puppy spends his/her days at our facility learning basic manners and service dog tasks, as well as napping, playing, and hanging out with P&A staff and volunteers. In addition, s/he goes on many socialization adventures taking trips to the city, riding on trains, walking on trails, visiting stores or malls, riding elevators, visiting schools or hospitals, etc. How does the dog get to and from Paws and Affection each day? The foster family is responsible for getting the dog to and from our facility each day. Drop off is between 7 – 9 AM and pick up is between 5 – 7 PM. Once you get the dog back on Friday afternoon, s/he will stay with you until Monday morning when you drop him/her off. What are the desired characteristics of a foster family? 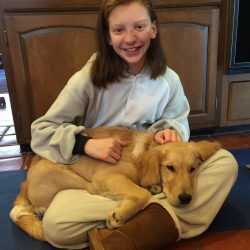 The foster family provides a safe and loving environment for the puppy while also having an active lifestyle that is inclusive of a service dog. In addition, the family needs to live or work close to our facility because the dog will be dropped off and picked up each day. An interest in dog training is important, as you will become this dog’s at home trainers and help solidify everything s/he learns at school. What if we are going away and the dog cannot come with us? Each dog has a secondary foster who takes the dog when the primary foster goes away. The secondary foster also takes the dog one weekend per month, regardless of travel plans, so a relationship is formed and the dog feels safe and comfortable in both homes. This offers a break to the primary foster as well. However, if you have a family vacation and want your puppy to come along, we encourage this. After all, everyone needs a vacation from working and learning, even our dogs! What is the difference between a primary and secondary foster? Each dog has both a primary and secondary foster family. The primary foster family has the dog most of the time, but the secondary foster family commits to taking the dog one weekend per month and is the first person the primary family contacts if they are going away, or need day-to-day dog care support. If the secondary foster is unavailable, the P&A trainers make arrangements for the puppy to have backup housing during that time. What kind of training does a foster family receive before the puppy arrives? We require both primary and secondary foster families to take orientation classes where they learn what we teach, our training philosophy, and how we communicate with the puppy. In addition we cover basic dog behavior, health, and safety. Once the puppies are living with us will we have continuing education? Yes. 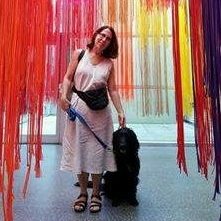 We meet every week in the evening to share what the puppy has learned so you can reinforce it. This is very important, as you will become an integral part of our training team, and we want to make sure everyone involved with the dog is on the same page. We are available for questions every step of the way and exchange information regularly. Will the puppy be house-trained when he or she arrives in my home? No. These dogs are only between 8 and 10 weeks old when they get here and have lived with their mother or in a kennel atmosphere up until this point. We help you train them, but you need to be prepared that there will be accidents at first. Do we stay in touch with the puppy after placement? You are invited to the graduation ceremony where the dog and the recipient are matched. This is where you meet the recipient and are a part of the magic you have helped create. While giving up your dog will be hard, the benefit will far outweigh the difficulty. Plus, once your dog is placed, you can get another one and begin the glorious process all over again!